The Big ZR Shop Sale! – Zombies, Run! The Big ZR Shop Sale! The ZR Shop has everything you need to represent your township with pride, or get something for the special Runner 5 in your life. And for a limited time, you can save 15% on your entire order when you spend $40 or more! Just enter the promo code ZOMBIES15 at checkout! We have a huge selection of merchandise available for Abel Runners, including Athletic T-Shirts, Mugs, Hats and Posters. You can even get your very own signed copy of the Zombies, Run! Book and save 15%! The sale runs until 30th November, so visit the shop soon to avoid missing out! 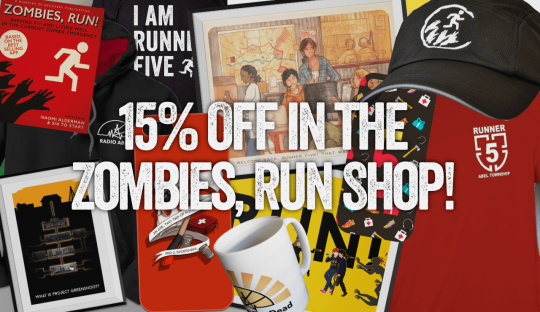 Visit the Shop and save 15% with coupon code ZOMBIES15 at checkout!